Obverse: Female head right wearing diadem and oak-wreath, most likely Venus, Pietas or Clementia. In the left field LII. Reverse: Gallic trophy consisting of horned helmet, coat of mail, oval shield, unusual dragon-headed carnyx (war trumpet) and to the right an axe. Text in the exergue CAESAR. History: There are only nine specimens known of this coin. It commemorates Caesar's conquest of Celtic Gaul from 58 - 50 BC which culminated in the capture of Vercingetorix, the celebrated chieftain of the Arveni. The large detailed portrait on the reverse is most likely the goddess Venus, from whom Caesar was believed to have descended, however some have identified the image as Clementia or Pietas. 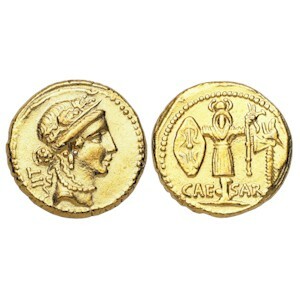 The Roman numeral 52 on the obverse represent Caesar's age when the coinage was struck.